​Click here for the 2018 Hurricane and Severe Weather Guide from the Houston-Galveston Office of the National Weather Service. Have what you need: Ensure your family has at least 3 days worth of food, water and supplies. This includes enough prescription medication to get you through this period, in case pharmacies and doctors' offices are closed. If you have seniors, children, pets or other special circumstances, make sure their individual needs are met. Download a copy of the City's Disaster Preparedness Guide at houstonoem.org for a checklist of things you should have on hand. Know your level of risk. Tropical weather systems can bring heavy rain and strong winds. Check to see your area's risk of flooding by visiting the Harris County Flood Education Mapping Tool at harriscountyfemt.org. Plan to Communicate: Develop a family communication plan, so that you know who to check in with after a storm. Visit ready.gov for information on how to do this. Stay Aware: Monitor current conditions with the National Weather Service at weather.gov/houston, and the National Hurricane Center at hurricanes.gov. Also, purchase a battery-powered or hand-crank NOAA Weather Radio to stay informed, even when the power goes out. Sign up for CenterPoint Energy's Power Alert Service, and stay informed about power restoration in your area. Know Now: Know how to safely turn off your utilities, this includes electricity, water, and gas. Only turn off gas if instructed by local officials or CenterPoint Energy. Check on your Neighbors: Work with your neighbors ahead of time to plan for heavy rain and strong winds. Remember that neighborhoods that plan together recover faster. 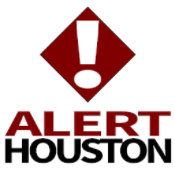 AlertHouston is the City of Houston | Office of Emergency Management's official emergency notification service.